It takes a lot of work by a lot of people to ensure that the millions of goods shipped each day arrive at their final destinations on time and in good condition. But for every 100 shipments that arrive unscathed, there are a few that arrive in less-than-perfect condition, and sometimes, the damages sustained during shipment can be attributed to nothing more than easily-avoidable packing errors. If your business has been bitten by packing mistakes in the past, take a look our tips for building a better pallet. When deciding how to arrange your boxes on a pallet, remember that heavy items should be placed on the bottom layer. This will help you create a stable base with a lower center of gravity. It also helps you avoid crushing any lighter, less-dense goods. For maximum stability and pallet density, arrange your boxes in a way that brings them as close to the edges of your pallet as possible, without hanging over. Bringing your boxes to the edge, makes strapping goods down easier and more stable. It also ensures that you’re using as much pallet space as possible. 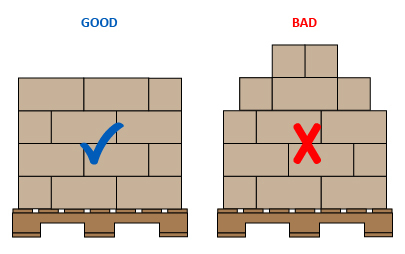 Any boxes or goods that overhang the pallet are more likely to be damaged or compromise overall stability. Overhanging goods can also cause automatic pallet dimensioners used by carriers to record larger length or width measurements, which can result in freight re-bills or re-classes. If possible, stack boxes in an overlapping brick pattern. This usually works best if you’re stacking boxes of the same size. If unable to use the overlapping pattern, make sure you rotate each new layer of boxes you add. Examples of both patterns can be see below. Whatever you do, avoid stacking boxes in columns with all the boxes facing in the same direction as this makes it easier for boxes to tip over or slide during transit. Many shippers make the mistake of placing smaller boxes toward the top of the pallet, causing the stack to narrow as it gets taller. This pyramid shape can compromise the structural integrity of your stack. If possible, work the smaller boxes into the stack so that the overall composition is a more cubic shape. Before wrapping your freight in shrink or stretch wrap, you’ll want to strap your freight to the pallet using heavy-duty packing bands made from steel, polypropylene, rayon or polyester. 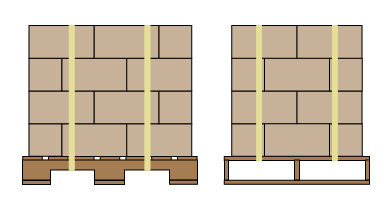 Fasten your freight to the pallet using at least two straps on each side as shown below. You can also use cardboard corner boards and slip sheets for more stability. Shrink wrap helps hold stacked boxes together so they behave as one unit, instead of many individual boxes. If wrapping pallets by hand, start by tying the end of your shrink wrap to the bottom of one corner of your pallet. After it has been knotted, begin wrapping your pallet and boxes from the bottom up. Include the bottom row of boxes, along with about three inches of the pallet, in your first three to four passes around the freight. As you move up the stack, wrap each new row twice. Overlap another three inches when your reach the top edge of the stack. The three inches should fold over onto the top surface. Finally, make four more passes around the middle to bottom part of the stack before cutting the wrap. Note: If you typically wrap more than a dozen pallets per day, it may make sense to invest in a pallet wrapper. They can wrap a pallet in far less time and with greater consistency than most people can manage. They’ll also spare your back from all the bending over it takes to wrap a pallet by hand! The most important thing you can do to improve the way you pack pallets is to consider all your stacking options. Many companies pack their goods in boxes of a few different sizes. Before packing your next pallet, make a list of all the common box sizes your company ships, then design different packing templates for all the possible stack combinations. Make a template for boxes of all the same size, then another template for boxes of two different sizes, then three different sizes and so on. It may also pay to rethink the way you package and box goods. 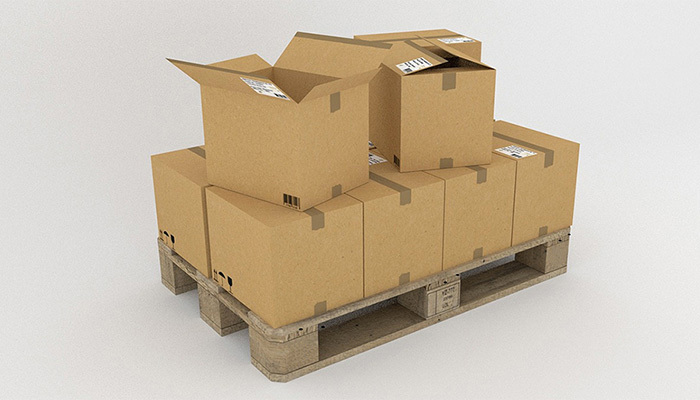 If you can ultimately reduce the amount of packing materials being used and/or use more boxes of a similar size, you may find it easier to pack pallets with better stability, strength and density.